1. Improved brain function : The brain functions well under certain conditions. One of them is drinking enough water. The brain cells are 90% made up of water. So, the more water you drink the more efficient you are! Another condition of efficient brain functioning is when it is at peace. This is what yoga does. It soothes the mind and makes it calm to take day-to-day decisions and tackle situations tactfully. Yoga and pranayam together helps in improving the functioning of the brain. In case you don’t know what exactly pranayam is, allow us to tell explain more on it. Pranayams are basically breathing exercises and does not involve any sort of physical exertion. It’s done by sitting in one place (mostly in Lotus Pose) and breathing accordingly. 2. Lower stress level : Stress is a part and parcel of our everyday lives. Men or women, young or old, we all have stress. 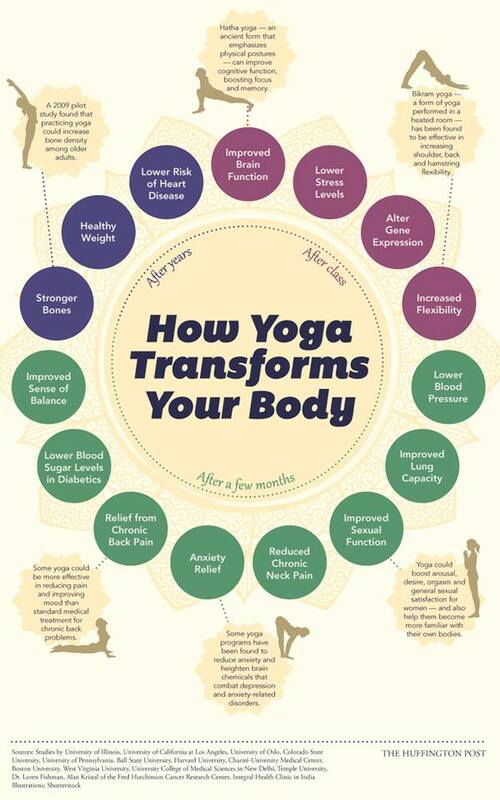 Yoga acts as the magic wand which when practiced regularly and religiously brings down your stress level. Reports show that people who regularly did yoga had comparatively lower stress level because they always had the peace of mind to deal with situations correctly. 3. Alter gene expression : In a research, a group of people were made to meditate for around 20 minutes or so. And later, their blood samples were taken and tested. There was a change in their gene expression(NOT CHANGE IN GENES). The changes were just opposite to that of stress. Thus meditation turned off the genes that resulted in inflammation, while turning on the genes that were associated with energy metabolism. This effect was more evident in those who practiced it on a daily basis. 4. Increased flexibility : Yoga mainly comprises of a lot stretching while standing at a particular place. Apart from pranayams, all the asans mainly include stretching that either removes the excess fat from the skin layer or benefits the organs in that place. Here are a list of five asans that help stretching. Dhanurasan(Bow Pose) : Lie on your stomach on the floor. Arc your hands backwards and hold the feet. Try pulling yourself backwards. By doing this you can feel the stretch in your arms, stomach and legs. 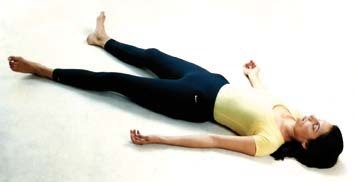 Bhujangasan(Cobra Pose) : Lie on the floor on your stomach. Keep your hands beside your shoulder. Push yourself up and look towards the sky as shown in the figure. You can feel the stretch in your stomach region. Uttanasan (Toe touching Pose) : To do this, first you need to exhale and take a deep breath in. Then slowly bend your body forward and get hold of you ankles with your hand. Your toes should touch the knees and hold the pose for a while. You may not attain the perfect pose on the first go but don’t give up and bend your body as much as you can. Salbhasan(Superman Pose) : Lie on the floor on your stomach. Raise your arms and legs (about 12inches from the ground) simultaneously. Keep them at the same level. Sarvangasan(Shoulder Stand) : Lift your body slowly. 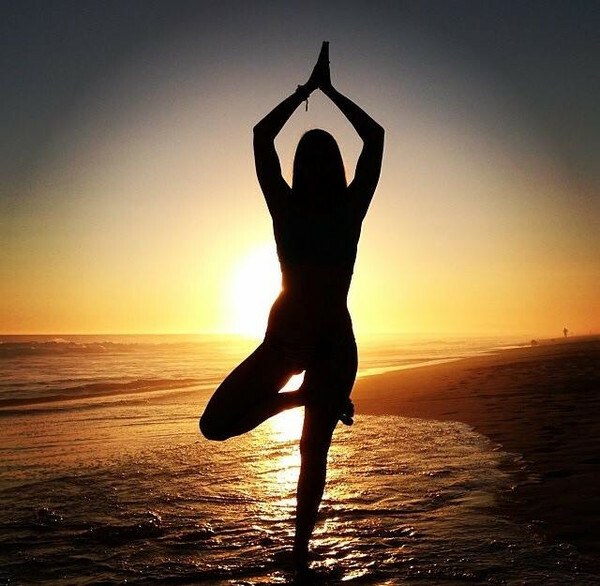 You might not attain the perfect shoulder stand but keep on trying and you will achieve excellence. And remember to bring down your legs slowly and not with a jerk. 5. Lower blood pressure : There are yoga that helps reduce blood pressure. Lowering of blood pressure is very essential as high blood pressure might lead to cerebral attack which is very fatal. Here are a list of five yoga that helps combat high blood pressure. Savasan(Corpse Pose) : Lying down with hands and feet kept free. Vajrasan : Sitting with legs folded in such a manner that they touch the buttocks. Ardh-halasan : Lie down on the floor. Lift one leg normal to your body. Hold the pose for a while. Repeat it with the other leg. Balasan(Child Pose) : Sit in vajrasan on the floor. Bend forward and try touching the floor with your nose while placing your palm on the floor. Hold the pose for a while. 6. Improved lung capacity : Every yoga and pranayam is accompanied by deep breaths. Since they are advised to be done in open spaces and during early mornings, so when you breathe in a lot of air, your lung expands and it’s capacity increases. Whereas short breathing in closed room doesn’t increase the lung capacity. 7. Improved sexual function : As per our above points, you can see how yoga increases the flexibility and balance in your body. Well this acts as icing on the cake because it helps you in doing various yoga poses which requires a lot of flexibility and balance. There is also a little known fact about yoga that it helps in controlling orgasms which helps you last longer in bed. Here is a list of five yoga that helps improve your sexual function. Marjariasan(Cat-Cow Pose) : How to do Marjariasan? Bhujangasan : Also known as Cobra Pose. Refer to the point above. 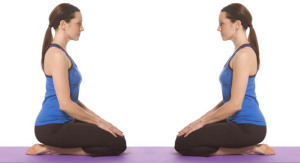 Baddha Konasan(Bound angle pose/Butterfly Pose) : Sit on the ground. Join your feet and bring them as close to you as possible. Now move your knees up and down. Paschimottanasan : Sit on the floor and stretch your legs to the front. Hold both of your toes with either your hand and try touching your knees with your nose. 8. Reduced chronic neck pain : Neck pains can be really irritating because it comes in the way of everything. But in yoga we do have solution to chronic neck pain. Here are a list of five yogas that should be performed on daily basis to get rid of chronic neck pain. Balasan, Marjariasan, Savasan : Refer to the points above. Natrajasan(King of Dance Pose): In order to do this pose, stand on a mat or on the ground. Lift a particular leg and hold it with the respective hand as shown in the figure. Stretch the other hand and keep t in chin mudra. Hold the pose for sometime and then repeat the same with the other leg. Trikonasan(Triangle Pose) : For doing this, stand on the ground by stretching your legs on each sides such that they form an inverted spread out ‘V’. Touch your left foot with your right hand while keeping the other hand straight and pointing towards the sky. Hold the pose while you look up and feel the stretch in the body. Do it with the other leg as well. 9. Anxiety relief : We all do want to get relief from unwanted anxiety. But not always are we successful. So here are a list of five yogas that will help you get rid of anxiety. Savasan, Dhanurasan, Sarvangasan, Paschimottanasan : Refer to the points above. Shirshasan(Supported headstand) : Lie down on your back. Slowly start raising your feet. Support your body at the hips with your hands. Then lift your chest region. Keep lifting your body till your full body weight is on your head. Hold the pose for a while. You may also do this against a wall for better support. 10. Relief from chronic back pain : Chronic back pains are pretty common issue these days. Regular stretching helps to get rid of them. You may check the five yoga that are given in the point ‘increased flexibility’. 11. Lower blood sugar levels in Diabetes : Diabetes is THAT disease which cannot be cured by daily dose of medicine prescribed by your doctor. You have to do a lot of physical exertion. But sometimes, due to some unwanted circumstances we are unable to workout. In these circumstances it’s very difficult to keep a check on our sugar level too. Here are a list of five yoga which is little time consuming but when practiced on a daily basis helps check Diabetes. Natrajasan, Trikonasan, Shirshasan : Refer to the points above. Utkatasan(Chair Pose) : Stand on the floor or mat as you may please. Bend both your knees simultaneously. You may keep your hands in front or up. Vrkasan(Tree Pose) : In order to do this post, stand on a firm ground. Fold one left at the knees and place them on the other knee. Join both the hands and push them upwards. Hold the pose for a while and repeat it with the other leg. 13. Healthy weight : Weight loss is an important part of our life. Reports reveal that people are mostly obese due to unhealthy lifestyles. But not always workout is possible. So here is a list of five yoga that will help you reduce weight and remain healthy in due course of time(when practiced daily). 14. Lower risk of heart disease : Just like diabetes, we can’t avoid out heart problems with just medicines. Sometimes a proper diet and a cautious lifestyle can also lead to heart diseases. So here we have a list of five simple yogas that will help you avoid heart diseases. Pawanmuktasan : Lie on the floor on your back. Fold one leg at the knees and press it on your stomach with your hands and try touching it with your nose. Hold the pose. Repeat it with the other leg. Then do it with both the legs simultaneously. Anulom Vilom : This is actually a pranayam. Pranayam is an integral part of yoga. Pranayam is mainly breathing exercise. How to do Anulom Vilom Pranayam? 15. Stronger bones : We are all aware of the fact how important it is for our bones to be strong. No wonder our mom’s force us to drink milk when we are young. But sometimes such situations arises which results in weak bones. Here are five simple yoga that will help you attain stronger bones. 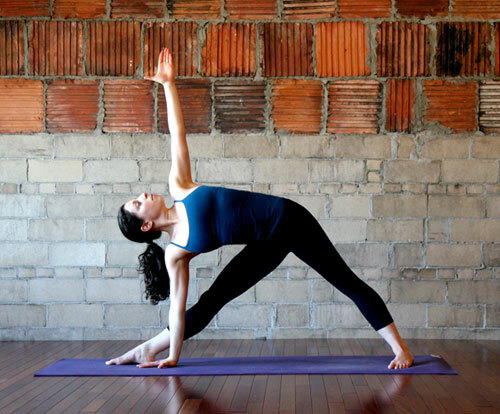 Setu bandha Sarvangasan : Also know as the Bridge Pose. In order to do this, lie on the floor or on a mat.Keep your hands by your side in such a manner that the palm touches the ground. Slowly raise the body from the hips region upwards. Hold the pose for a while. Thank you for visiting HNBT. Hope you find our article useful. I enjoyed all the themes of this page. I love them. I need help i’m 26 an i weigh 298 i take seizure medicine and have had 2 brain surgeries and i can only do so much of exercise with the precher on my head so i nead help on how to lose 50 pounds.